This recipe is one more good old and traditional summer dish, which is very familiar to all Kannadigas (people belong to Karnataka, India). This dish is prepared in southern part of India, where, rice is used as main course. This dish can be prepared in many ways, but I am showing you the simplest way of preparing this tasty and spicy dish. I am using natural herbs and spices along with green mango, which are good for health. You can serve this dish as breakfast or else you can serve this dish as second to main course for lunch and dinner. This is an ideal dish for picnic, it is easy to prepare in short time and easy to pack and carry. You can prepare this dish with leftover rice as well. Let’s see the preparation of this tasty and spicy Mavinakayi chitranna/green mango rice. Wash the rice with plane water and soak it in water for 10 minutes. Soaking the rice before cooking helps to soften the rice after cooking. If you are using basumati rice, you can add 2 cups water for 1 cup of rice. If you are using sona masoori or any other type of rice, you can add 2 ½ cups of water for 1 cup of rice. Cook the rice in rice cooker or pressure cooker, whichever cooker available in your kitchen. Meanwhile, grate the green mango after removing its skin and store it in a small box. Grate the dry coconut and keep it in a box. You can store remaining part of grated mango and grated coconut in refrigerator. 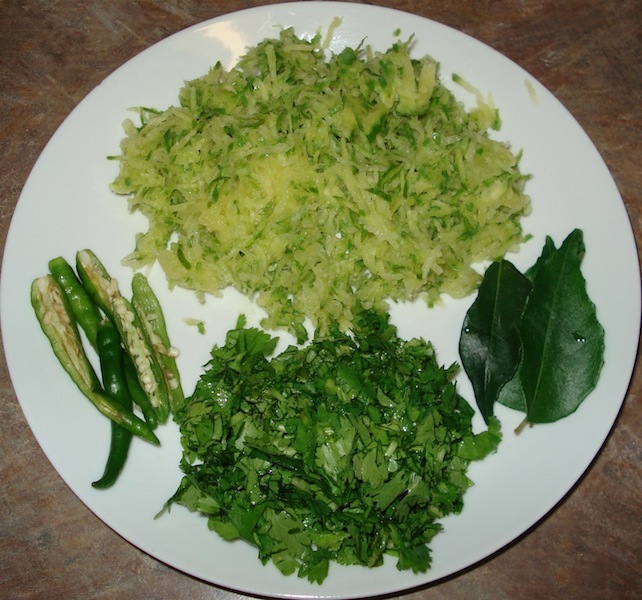 You can prepare dal, kadi or any type of curry using grated mango and you can use grated coconut in preparing any vegetable(subji), rice or any payasam(sweet). Make a fine powder of 1 tea spoon mustard seeds and keep it in a bowl. Chop green chillies, coriander leaves and keep them separately. Pour the cooked rice in a wide bottomed bowl, do not tamper it leave it as it is, if you tamper it, it will be mushy. Sprinkle salt, mustard powder and 1 table spoon of grated mango, one after the other, over cooked rice evenly. Now, seasoning part begins. Heat a small pan, pour oil in it, add 1/2 tea spoon mustard seeds and allow them to split, after splitting, add groundnuts, chana dal, udad dal, curry leaves and chopped green chillies, one after the other (you can keep 10 seconds difference), stir with a spoon, add hing and turmeric powder to it. Remove the pan from heat. Important thing to be noted while preparing seasoning is – whenever you add any ingredient to hot oil, you have to stir it continuously otherwise they will be burnt and become black, they taste bitter as well. Continuous stirring helps the ingredients to generate a pleasant flavour and to turn into golden brown colour. Pour the seasoned oil (tadka/voggarane) on cooked rice. Leave the rice as it is for 10 minutes. After 10 minutes, spread grated coconut and chopped coriander leaves over rice. mix them well, if you want you can add some more salt and grated mango to it. Now your tasty mavinakayi chitranna is ready to serve. You can serve it for 2 persons.